1991 Revision. Photo taken by Al Rogers. Cooper Revision. Photo taken by Al Rogers. 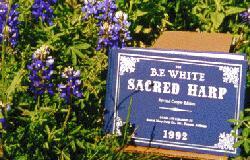 Sacred Harp is religious folk music, which is sung with the aid of a unique shape-note songbook, The Sacred Harp, first published in 1844 by B. F. White and E. J. King. Sacred Harp singers produce a quality of sound, which is strangely compelling. Sung a cappella, the music is distinguished by its considerable use of the minor key and its unusual four-part harmony. Sound Clip from Southwest Texas Convention. Audio by Joshua Martin. Video Clip from Southwest Texas Convention. Video by Laura McCarty. 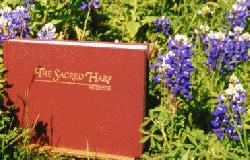 The Sacred Harp tradition developed out of the singing school movement which began in New England in the late 1700's, then spread to the rural South and finally to Texas. The early singing schools employed the English solemnization technique, which uses syllables "fa, sol, la, mi" to denote the tones of a musical scale. Singers would learn a tune by first "singing the notes" then repeating the song with the lyrics. This custom remains a distinct aspect of Sacred Harp singing, which takes its name from one of the most popular shape-note songbooks. Southwest Texas Convention, Spring 2005. The singers sit in a hollow square with space in the middle for the leader. Tenors face altos, and basses face the trebles. The goal is to build a sound and spirit for the singers to enjoy. The songs are old songs, some 200 and 300 years old. The music has its beginning by oral preservation of singing techniques, rhythms, and melodies from other lands and other times, as well as from the American eighteenth and nineteenth centuries. This oral heritage includes 18th-century revival spirituals, ballads, and dance tunes of colonial America by way of England. 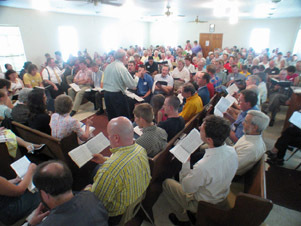 In recent years, Sacred Harp singing has undergone a revival all over the United States. Regular singings are now held in over 30 states, in Canada, and in The United Kingdom. Morning Trumpet Recordings�mostly older recordings (field and studio), some dating back to the 1940's and 1950's. Includes some recent field recordings and also some non-traditional recordings.